(WARNING: if you are a bit squeamish, I recommend you to read another post in this blog. In any case, this article about the Romans butts should not be read right before or after a meal. I am not responsible for any grievances). 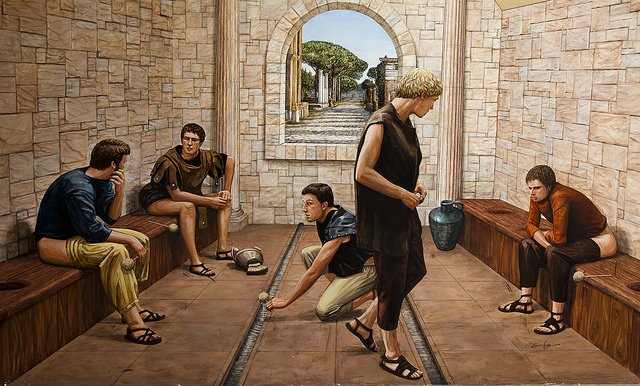 Romans in the bathroom (Click for more detail). More striking, if possible, was the method used by the visitors to the baths to wipe their butts. In absence of toilette paper, the butts cleaning device was a wooden stick with a sponge attached at one of the ends (often, literally a sea sponge), or some type of cloth or animal wool. If you look carefully at the illustrations, you can see the gutters just in front of the seats, where sea water ran continuously so they could rinse their sponges after each use. To make matters worse, the sponges were also public and only the wealthier carried their own. 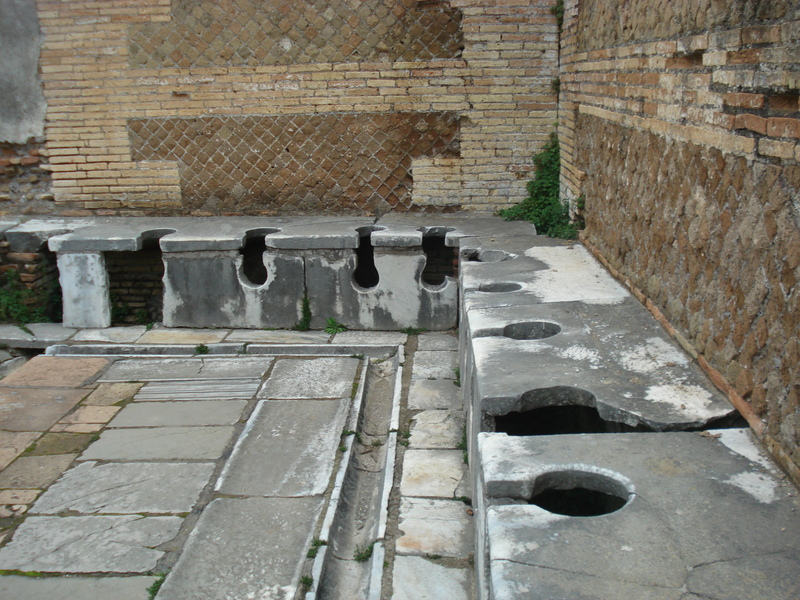 A second option for the Romans to wipe their butts, when public bathrooms sat in the poorer neighborhoods, was simply to use the hand (not very differently to how is currently done in some countries), which was rapidly washed in a fountain installed for that purpose. I think you don’t need any more details. In those days it was a common practice, except in China, where paper had been used for the private parts since the second century b.C. I imagine that some of you are already sending a prayer to the inventor of modern toilette paper, I sometimes do. During the years that I have been studying the Romans and their traditions, this has been the most noteworthy and strange aspect I have found. I cannot criticize them for these practices because, truth to be told, they didn’t have many options and they were the victims of the limitations of their time. In any case, it wasn’t that bad. What is important for me is that many of their public bathrooms have survived and have given us the opportunity to better know the culture of our ancestors. I hope that, as nasty as the matter may be, you have learned something new about the Romans. «So one of the men ran off at once, took a sponge, and soaked it in some sour wine. Then he put it on a stick and offered Jesus a drink. :» I’ve wondered if part of the insult, now unknown to our times, was this was the same sponge you just described? I have heard that the use of the sponge on the stick for cleaning is the origin of the phrase «grabbing the wrong end of the stick». Maybe yes, maybe no, but still an un-appealing image. I didn’t watch the series «Spartacus», but other readers have call my attention to the point…maybe it’s time I give it a chance. Thank you for your comment. I’m so glad I live in this century. Great article, I learned something today. The wine and vinegar mixture the Roman soldiers attempted to give Jesus, as he was dying on the cross, was with one of these sponges they used to wipe with. I have always been interested in history, especially in regard to the more mundane aspects of life in various cultures. It puts things in some context, especially (as others have suggested) the Roman soldiers’ offering of the sponge to Jesus. Thank you very much for your kind comment. Best regards!